This tasty pepper steak recipe is a combination of tender steak strips, red and green bell pepper, tomatoes, and soy sauce. This Asian-inspired American dish has become a favorite meal for many families. We use sirloin steak in this dish, but flank steak or top round steak would be good as well. This version is made with the addition of Cajun or Creole seasoning. If you don't have it, use another seasoning blend or seasoned salt mixture. Serve the pepper steak with hot cooked rice. 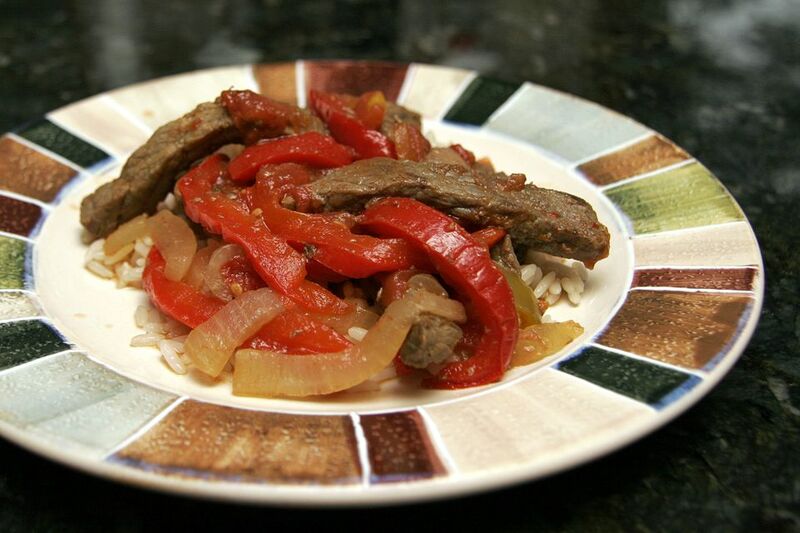 This slow cooker pepper steak is another version. It's made with some ginger, soy sauce, and a small amount of brown sugar. Or try this easy skillet pepper steak with flank steak or round steak. Heat olive oil in a skillet or sauté pan over medium heat; add steak strips. Cook, stirring until steak is browned. Add onion, garlic powder, pepper, Cajun or Creole seasoning or seasoned salt and cook, stirring, until onion is tender. Add the pepper strips and beef broth; cook for about 3 to 5 minutes longer. Add tomatoes and soy sauce and bring to a simmer. Simmer for 2 to 3 minutes.